The installation of indoor unit is made easier by the wall hook bracket. It is a sort of the aluminum template with all the necessary holes and the attachments. All one has to do it make the holes in the wall as per the template and then fit the template with screws. 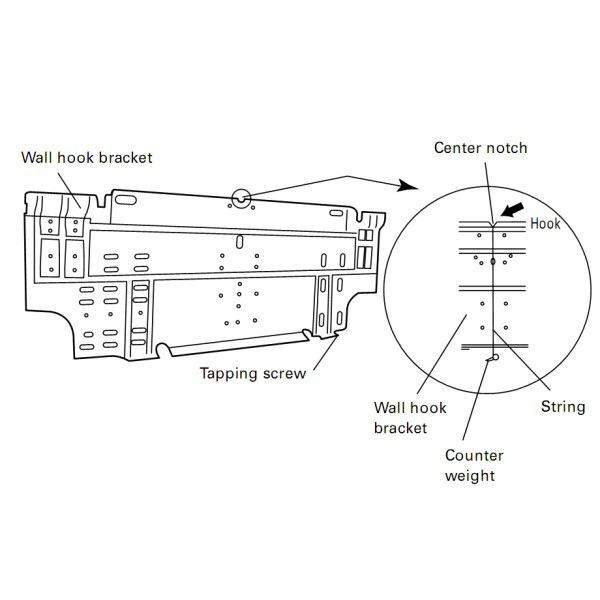 For this the air conditioning technician makes the marking of the wall hook bracket on the wall coinciding with the holes on the bracket. When making the markings for the holes, make sure that the bracket is given slight tilt angle, so that the indoor unit, when fitted is also at a slight angle to enable unhindered flow of the dew water from the drain pipe. After making the markings for the holes, remove the wall hook bracket and make the holes in the wall with drilling machine at these markings. Thereafter, keep the bracket in place again on the wall and fit it with the screws in the drilled holes. Make a small hole of about 3 inches near the bracket across the wall or partition. Through this hole the refrigerant tubing connecting the indoor and the outdoor will pass. These tubing are insulated hence they need hole of large diameter. The drain pipe though which the dew water is drained also passes through this whole. Through this hole the power supply cable and electric cable connecting the indoor and the outdoor unit also pass. Now, the indoor unit is ready to be fitted on the bracket. Just lift up the unit, it is usually not too heavy, and fit it on the wall hook brake bracket. There are some male extensions on the bracket on which the female counterpart of the indoor unit can be fitted. 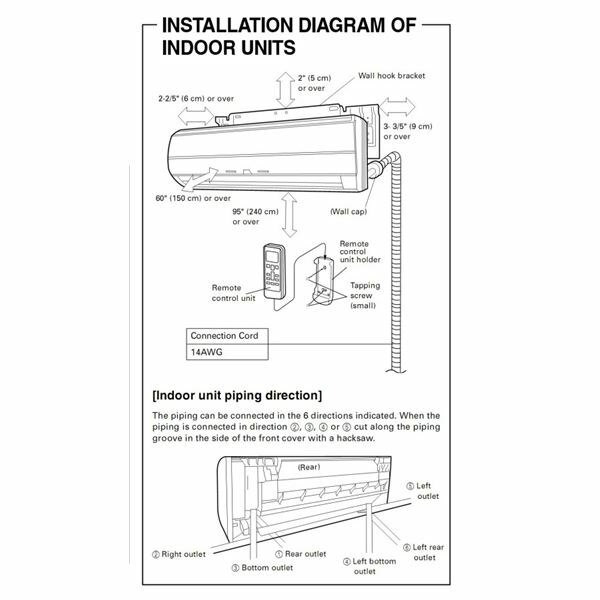 When fitting the indoor unit the copper tubing extending from the unit has to be passed through the hole and to outside the room for connecting it do the outdoor unit. The drain pipe is connected to one end of the indoor unit; it is passed through the hole and left free in the open space where the water can be drained. The power supply cable connecting the indoor and outdoor unit and to the main supply is also passed through the hole. The indoor unit is given slight tilt of about 2-3 degree towards the drain pipe. 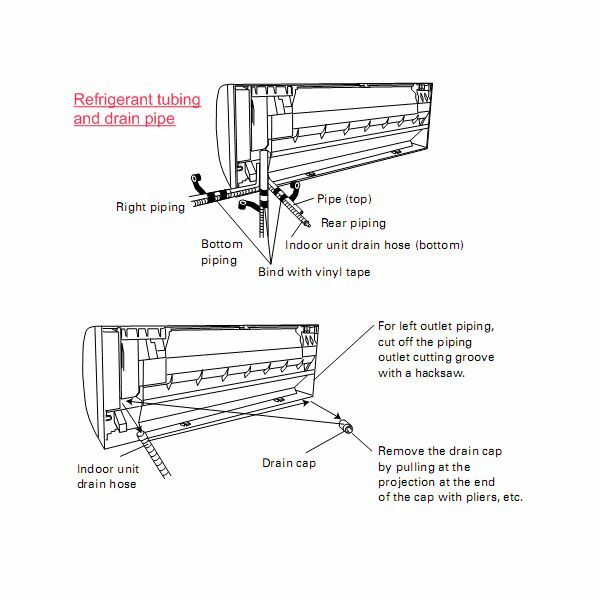 This enables unhindered flow of dew water towards the water space where drain water is collected and drain pipe is connected for removal of water. This angle should be just sufficient to enable flow of water without disturbing the looks of the indoor unit due to high angle of tilt. Too small angle will not serve the purpose and high angle will make the easy looks shabby and also unbalance the blower inside the unit. The level of the unit can be checked with the level bubble gauge. With this the installation of the indoor unit is almost over. It is now ready to be connected to the refrigerant tubing and the outdoor unit. The power supply cable is yet to be connected.